I’ve just released a minor update for Scup. If you have already installed Scup, you should get the update automatically the next time you launch it. If not, get it here. That’s right, Scup is now out of beta! You can grab the 1.0-release from the newly designed website dorianroy.com/scup. 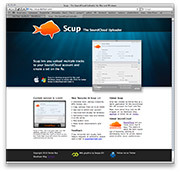 If you have already installed Scup, you should get the update automatically the next time you launch it.